Klamath Lake Blue Green Algae - Superfood for skin! Klamath Lake Blue Green Algae – Superfood for skin! Aphanizomenon flos-aquae (AFA) Blue Green Algae is widely agreed to be the most ancient food on earth. It is one of the few edible microalgae, and it differs from other microalgae grown in ponds, such as Spirulina and Chlorella, because it grows wild in an optimal environment. This allows it to develop a remarkable nutritional profile. At the bottom of the food chain, blue green algae is the most nutrient-rich food (ounce for ounce) known to be created by nature. This simple organism is complete nutrition in its most basic form and is a superb natural source of nutrients for the body, including topically! Before we dive into the benefits, it’s important to point out that the Blue Green Algae that we sell arrives at our facility as food grade, however, because we are a cosmetic manufacturer once we receive this into our building it is immediately considered to be a cosmetic and not for human consumption. Where does AFA Blue Green Algae come from? The Pacific Northwest is an outdoor paradise. We enjoy some of the cleanest air on the planet and we just happen to have the perfect natural lake for growing and harvesting USDA Certified Organic Blue Green Algae. Nestled in the shadow of pristine Crater Lake and fed by more than seventeen natural springs of astonishing beauty, Klamath Lake is the largest (by surface area) freshwater lake (97 square miles, elevation 4500 feet) in Oregon, draining a watershed of more than 9,800 square miles. Klamath Lake is a large, slow moving river transporting water from Crater Lake. Klamath Lake never stops moving, allowing the water to flow all the way to the Pacific Ocean via the Klamath River. It is one of the cleanest and purest bodies of water found in North America. Crystal clear mineral springs fed underground from Crater Lake supply Klamath Lake with a wealth of minerals resulting from a thick layer of volcanic ash spewed over the Klamath Basin during the eruption of Mount Mazama seven thousand years ago. Only the perfect natural ecosystem of Klamath Lake offers a unique algal species the habitat that it needs to flourish. The extremely volcanic mineral rich geographic region, the intensive solar energy of the high elevation and the constantly moving, oxygen rich crystal clear waters, make blue green algae (Aphanizomenon Flos-Aquae) or (“invisible flower of water”) one of the most nutrient-rich abundant whole green foods on the planet. Why is Blue Green Algae a Superfood? Blue Green Algae contains 20 antioxidants, 68 minerals and 70 trace elements, and important enzymes. 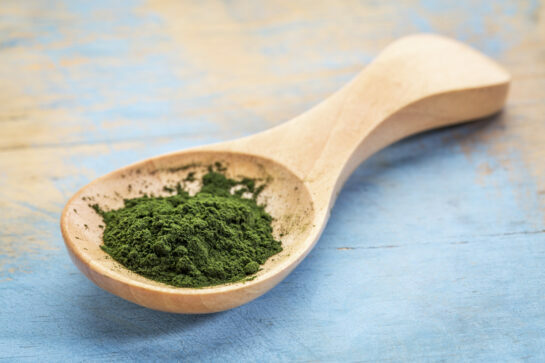 In particular, its high nutrient density and the synergistic effect of the trace nutrients it contains makes blue green the ultimate superfood. It also contains all essential and non-essential amino acids in a proportion which is identical to the human body. But wait, that’s not all! It contains a complete and balanced spectrum of vitamins, including the vitamin B spectrum and high quality vitamin K. It is the vegetable source with the highest amount of B vitamins. It contains vegetable source B12 which is significant as it is the only source of vegetable B12. Blue green algae is not only one of the most nutrient-dense ingredients we sell, but also one that has been self-designed by the most intelligent and life-supporting organisms on earth. Cool fact – our brains are made up of neurons that are individually no more intelligent than algal cells. The brain’s intelligence arises from the remarkable connection of its cells to each other. However, simple forms of algae also have this remarkable connection to share knowledge by transferring tiny strands of DNA called replicons. These travel through air and water, just as signals can be sent from one neuron to another in our brains, and are received by other algal cells – integrating with their DNA and subsequently passing down to new generations. Given that this information sharing is on a much larger scale and not limited to the skull cavity, and that this giant brain has been thinking for a million times longer than human civilization has existed, the human mind would probably be unable to even comprehend the magnitude of algal intelligence. See the book “Edible Microalgae” by Jeffrey J. Bruno, Ph.D for more information. Ready to start getting all of that wonderful superfood nutrition to your skin? Check out this recipe for a Four Elements Full Body Masque! Earth, Fire, Air, Water – In ancient Hinduism, these four elements are associated with the five senses, and act as the medium for the experience of sensations. The basest element, earth is created using all the other elements, and it can be perceived by all five senses – hearing, touch, sight, taste, and smell. The next higher element, water, has no odor but can be heard, felt, seen and tasted. Next comes fire, which can be heard, felt and seen. Air can be heard and felt. There is a fifth element that is a little more ethereal called Void that is sometimes referred to as self or consciousness so as you let the air dry this full body masque, incorporate the fifth element by relaxing, meditating and letting your consciousness drift. Yield – approximately 6-7oz by volume and ¼ pound by weight – enough for 1 or 2 full body applications depending on hair length. Add all ingredients to your mixing bowl and mix until fully blended. To use: Add water and mix into a paste. Apply to hair, face and body. Leave on 10-20 minutes and rinse. Please contact us if you have any questions info@ewlnatural.com or 866-252-9639.